The Arithmetic Progression in mathematics is a sequence of numbers that explain the difference between any two successive terms and the value is always a constant. The difference between two terms is named as the common difference in mathematics or the arithmetic sequence. This is a common topic of study statisticians and mathematicians worldwide working on real-life situations. As given in the example above, a is the first term in the sequence, the difference between terms will either increase or decrease called the common difference and given by d in mathematics. In general words, there is total n number of terms in an arithmetic progression with the initial term a and the common difference d.
where a is the first term of the progression and d is the common difference. 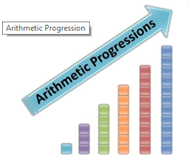 The arithmetic progression of AP is a common concept and easy to understand as well. If you will look around then it is used frequently in our daily lives. Examples could be roll numbers of students, days in a week or month or year etc. if you will notice then odd numbers, even numbers, all follow the concept of arithmetic progression only. The calculation is even easier with the help of a standard formula as mentioned earlier. For an AP series, every number is obtained by adding a fixed number to the previous ones. If the terms are increased or decreased with the same number throughout then it is an AP series. If the terms are multiplied or divided by the same number the resultant sequence would be an AP series again. Based on these properties, you can quickly identify either the given series is AP or not.